I still don't regret doing this pee stick experiment. Seeing one line is never a nice thing, but it's definitely getting a little easier to bear. I realised this morning that I was being a little selfish, that I was doing this for me, so that I would be ok with the event of a failed IVF cycle. This morning, I sat down with Jase and told him my fears, that I had this horrible feeling we wouldn't be lucky this time time around. He was okay, just gave me a hug and a kiss on the forehead and told me not to give up hope. Yes, it's still early. I'm just... resigned. I can't describe it - I just want this to be over. I want this to be a positive so, so much. I want to be one of those amazingly lucky women who gets her BFP after the first IVF cycle. I want to beat the crappy odds we've had through this cycle, from a rubbish egg pickup, to terrible fertilisation rates, to our one miracle embryo. But, realistically? I can't get fully on board with it. I'm not that person. I don't get lucky like that. I will keep plugging away. I won't give up hope. But I'll be ready for this massive disappointment, if it comes. This entry was posted on 09:26 and is filed under Emotions , IVF , TTC . You can follow any responses to this entry through the RSS 2.0 feed. You can leave a response, or trackback from your own site. 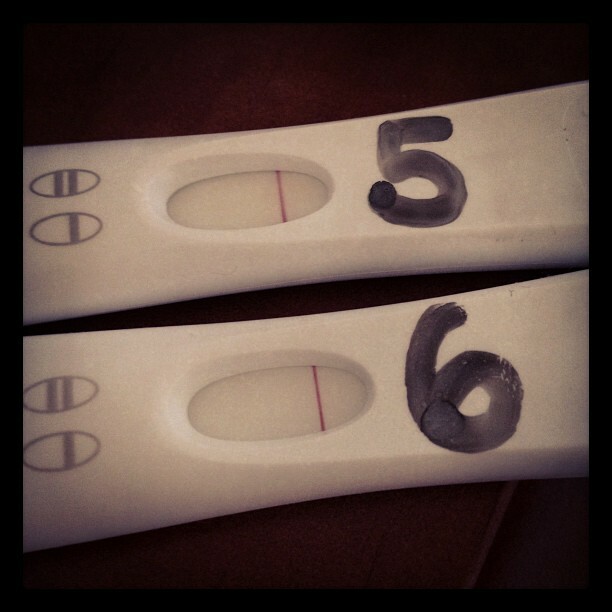 completely understand your need to pee on sticks - people who don't have never struggled to get pregnant. i also completely understand WHY you're peeing on sticks too. it's because you want to know but it's also because IF [and that's a big IF, the fat lady hasn't sung yet] it hasn't been successful, it won't come as a massive shock. as i said the fat lady hasn't sung yet honey and i'm still keeping everything crossed that you're "one of those lucky women" who get knocked up on their first ivf, i truly am. Evil statistics ruling our worlds.....I like maths just not when it comes to my uterus. Good luck, not just for the pee sticks but for the emotional journey. I am still very hopeful for you. It's too early - but that you know. The anxiety during the two week wait is the worst! But you'll make it through. Take care and good luck! Fingers still crossed for you!